The sales landscape has changed dramatically over the last decade. Organizations are implementing sales enablement strategies in order to stay ahead of the market. These strategies help sellers improve productivity, accelerate the buyer’s journey, and ultimately reach their target sales goals faster than ever. If these are all goals you’re looking to accomplish with your sales team, it might be time to invest in sales enablement. 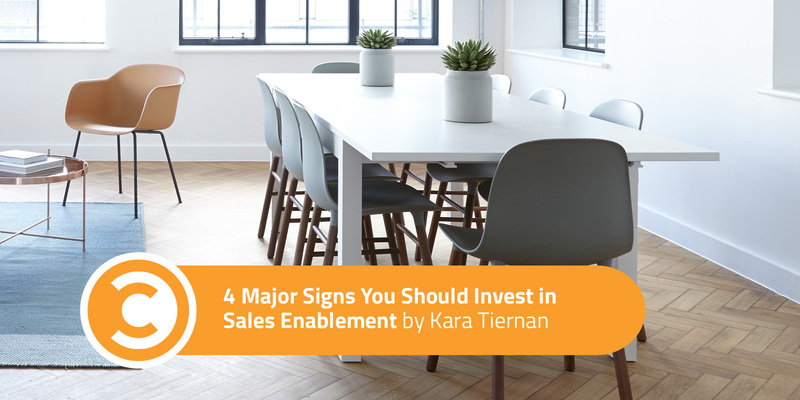 In this post, we’ll review five signs you might need to invest in sales enablement, and how your organization can work towards a successful journey today. If you’re in marketing or sales management, you may often feel like you have to keep tabs on your sellers, as you don’t want them going rogue and adding slides to their decks that are off-brand. Your organization likely spends a lot of time and energy creating engaging content for every stage of the buyer’s journey. So why are sellers still inserting dated slides that completely alter the company messaging? If you’ve been trying to micro-manage your sellers’ content, this may be a telling sign you need a better sales enablement strategy. Sales enablement tools actually allow you to let sellers run wild (within reason!) without fainting. With sales enablement, you can empower sellers to choose the right content that’s resonating the best, based on high visibility, into how sales decks are performing across the organization. This gives them the edge they need to move prospects through the sales cycle quicker with content you know will resonate. Sales enablement also allows sales leaders to implement best practices and ensure every seller always has the most effective materials at their fingertips. It also helps you spot content that’s being circulated with last year’s messaging, and easily find and kill dated content. Don’t keep sellers on a tight leash. Empower them with the right solutions, and rest easy knowing they’re sharing the right content with the right audience. You’ve probably heard the grim statistic that 65 percent of marketing content is never used by the sales team. This means nearly two-thirds of your investment in marketing content is wasted, and the ROI of content that’s never used is zero. Yikes! If you think you’re spending a lot of time creating content that isn’t getting used in the field, it might be time to invest in sales enablement. You can ensure you’re dedicating resources efficiently by measuring the business impact of your content. Sales enablement tools with analytics capabilities allow you to track content availability and usage at every sales stage, as well as measure and optimize your content performance. You can pinpoint what content is helping generate revenue and ensure you’re dedicating your resources appropriately to maintain high performing content with high ROI. If you’re spending all of your time in content creation, you want to ensure the message you’re arming your sales team with is resonating every time. If you don’t have the tools to measure your content effectiveness, you could be wondering why your prospects aren’t answering your emails and phone calls. Sales enablement tools with analytics capabilities provide the data you need to gain actionable insight and create and maintain better content that will ultimately help sellers close more deals. Analytics not only allow you to track engagement of your sellers’ presentations, but also track open rates, downloads, and shares of all of your assets via email, your website, etc. This gives you the ability to track what content your customers are spending the most time on. It also provides a holistic understanding of what messaging is working and what isn’t across the organization. This is invaluable and allows you to take the guesswork out of content creation and strategy, as well as help your marketing team align content for every stage of the buyer’s journey for each persona. Whether you work for a Fortune 500 company or a growing startup, it’s crucial to ensure your sales team is working as efficiently as possible. If one of your sales reps meets with a prospect who’s interested in your product and wants to see examples of similar customer use cases and estimated ROI, you need to ensure your sellers have that data on the fly. But if your company doesn’t have an organized content repository, the chances of your sales rep finding the right content quickly are slim. This is where sales enablement comes in. Companies can easily increase sales productivity by implementing sales enablement tools that include Content Management Systems (CMS) with granular search capabilities. In a recent study conducted by Highspot, 75 percent of respondents from companies using sales enablement tools reported that their company had increased sales over the past 12 months. Nearly 40 percent reported sales increased more than 25 percent. It’s easy to put sales enablement on the backburner, but taking time to research the right tools for your team can make a huge impact on sales productivity and pipeline. Investing in sales enablement not only helps sellers identify the right content to improve customer conversations and increase sales readiness—it ultimately helps your organization create better content that resonates with consumers, closes more deals, and helps you generate more success. 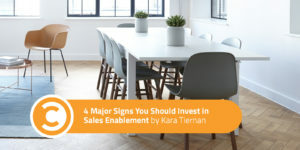 Kara Tiernan is a content strategist at Highspot, the sales enablement industry’s leading solution for content management, customer engagement, and analytics.